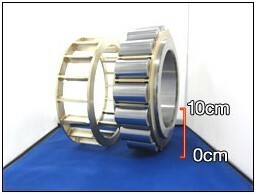 NSK Ltd. (NSK; Headquarters: Tokyo, Japan; President and CEO: Norio Otsuka) announced that it has developed a high load capacity cylindrical roller bearing for large gearbox applications that achieves longer life thanks to an increase in load capacity over the conventional product. 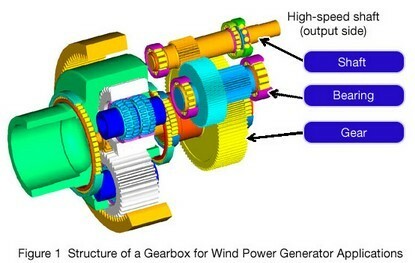 NSK is targeting global sales of 1 billion yen a year in 2015 by expanding the sale of this product for large gearbox applications such as wind power generators, which require high load capacity. The gearboxes* for large industrial machinery such as wind power generators and mining machinery typically use cylindrical roller bearings in order to sustain the high load conditions of such applications. In recent years, wind power generators have increased in size in order to increase generation output. Also, mining machinery is used 24 hours a day, 365 days a year under severe conditions due to the advancements being made in emerging nations. For these reasons, bearings used in such large gearboxes require even higher levels of reliability. In response to this need, NSK has developed a cylindrical roller bearing with increased load capacity for higher reliability in large gearbox applications. * Gearbox: A device that converts input revolutions to the desired level of output revolutions through the meshing of multiple gears between the input and output shafts. By increasing the number of rollers, NSK has reduced value of surface pressure exerted on the contact area between the rollers and rings, thereby increasing the load capacity and lengthening the life of the bearing. Increasing the number of rollers results in thinner cage walls, which in turn, weakens the cage. 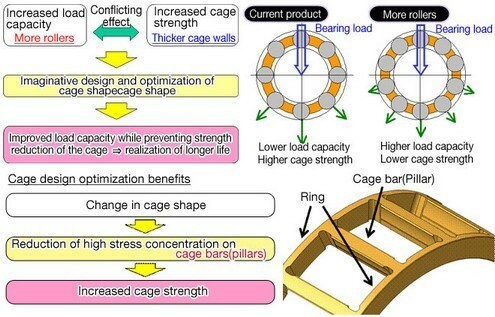 NSK countered this side effect by optimizing the cage shape to suppress stress concentration in the cage bar members, thereby achieving a sufficiently strong cage. This product achieves an approximate 30% increase in life over that of the current product, improving the reliability of gearboxes even in harsh environments.